Whether a company uses Pardot to build a new marketing function or is looking to further develop its existing marketing efforts, integration with Customer Relationship Management software is key. Transparency between the two platforms enables sales and marketing teams to communicate efficiently with one another and to share information on potential prospects. SugarCRM integration with Pardot has been critical to companies in the finance, non-profit, and healthcare industries. Each of the companies mentioned below are W-Systems customers. Our engineers consulted with these companies and customized SugarCRM to work uniquely with Pardot for the customers’ specific industry. Transcend Capital is a brokerage firm that uses Pardot’s nurture program in combination with a custom web form. 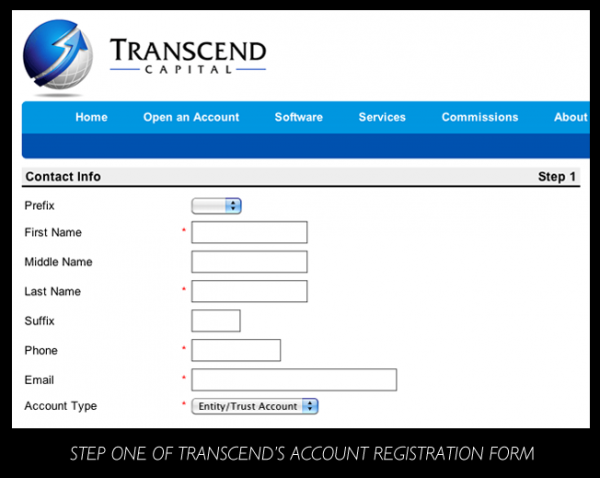 The account sign-up form on Transcend’s website is a multi-step process. Several things occur in the background when completing the form, including criminal background screening and integration with Penson Financial. In addition to pushing information through to the CRM system after each step, the web form is tied to Pardot’s drip marketing program. If a prospect falls out of the application process at any step, they are placed into a particular drip program depending on where they fell out. The company can also capture and track at what step people were dropping out of the application process and can then analyze and report on those metrics. The Linux Foundation is the non-profit that serves the Linux developer community and the corporations that are interested in leveraging Linux for their product portfolio. The Linux Foundation is using SugarCRM and made the choice to deploy Pardot because of its ability to handle large quantities of email. The company also wanted to take advantage of the nurture program and more easily segment sponsors, corporations, and the Linux community. 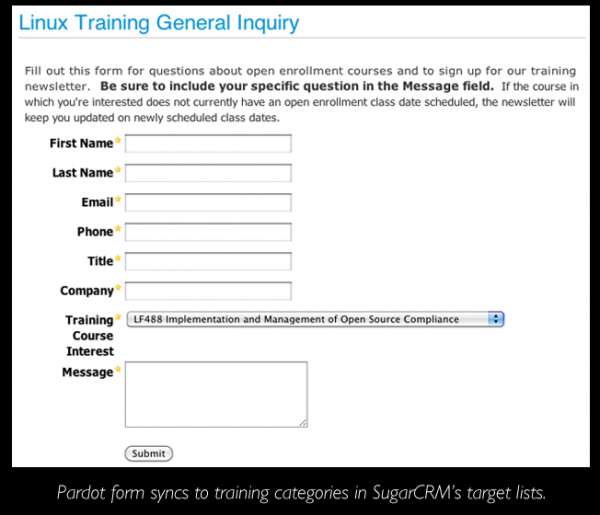 W-Systems built a custom module in SugarCRM to store each form submission and categorize what type of activity it is (Training, Education, Membership, etc.). All new activity from Pardot is automatically synced to SugarCRM and creates the appropriate record depending on what form category it was. The Linux Foundation can then run all of their normal reports for new memberships or number of training inquiries based on these activities. 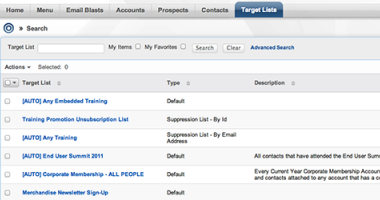 Pardot segmentation lists also sync with target lists in SugarCRM whenever a new activity comes in or a new lead or contact is created. Medicat is an electronic health management software built for the college health market. In early 2011, Medicat deployed Pardot to work with its current SugarCRM system and hired its first full-time marketing person. 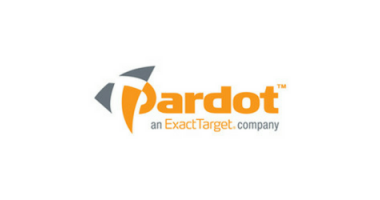 Medicat uses Pardot as a customer communication and retention program through campaigns, webinar registration, monthly newsletters, and autoresponders. Medicat’s monthly newsletter communicates new product features and helpful training resources. From the newsletter, Medicat is able to track what topics are of higher interest and can develop better content accordingly. Medicat is also using Pardot to host its own virtual conferences through WebEx. They built a landing page in Pardot specific to the event. They also made the agenda click-able and separated each session into links that point to different WebEx registrations. This allowed people to choose specific sessions without having to register for the entire event. It also enabled Medicat to see who attended specific presentations and track that intelligence. W-Systems' VP of Products and Technology, Bill Harrison, will present these case studies in detail at Pardot’s User Conference on Tuesday, November 15 at 1:45 PM. Stop by to learn how Pardot and SugarCRM are used in different industries. For additional information contact W-Systems.